Fencing Academy of Boston offers fencing classes and private lessons for fencers at any age. We welcome newcomers to the sport of fencing, as well as experienced fencers who are motivated by the challenge of competition. Fencers 15 and older, please refer to our Adult Fencing programs. The self-confidence that comes with fencing is particularly important to kids. 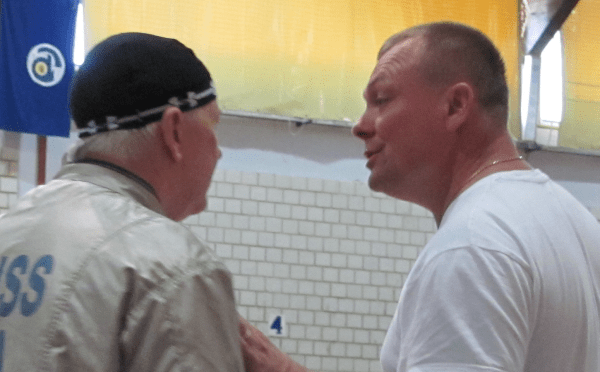 When a child learns to defend him or herself in a martial arts setting, performs in a public sporting event where an objective score is kept, and adapts to constructive feedback from coaches and referees, the benefits last all their life. Starting good fitness and exercise habits in young people is important for their health and well-being, and fencing could be the right fit for your child’s interest. Colleges actively recruit high-school fencers with scholarships, and fencing can be an alternative to the crowded football, baseball, basketball and soccer tracks for youths with athletic skills. Fencing is an equal opportunity sport for girls and boys. We hear this a lot: “I have always wanted to try this!” and it never wears out. Adults at every age can find a great reason to learn to fence. Fencing is a fun way to get fit and stay healthy, improve strength and endurance, and increase personal confidence. Physical fitness never has to be boring again. Uniquely for older athletes, the sanctioning bodies for tournaments (USFA in the United States) have age-stratified entrance categories for competition. A “veteran” is anyone 40 and over, and qualifies one to enter veteran-only events, typically divided by decade up to 70+, in addition to competing with younger adults in the general category of “senior”. Several Fencing Academy of Boston members did not start learning to fence until later in life and some have earned National and International medals in their veteran categories. How far do you want to go? Membership – Fencing Academy of Boston is not only a fencing school, it is a fencing club. We take a lot of pride in the quality of the instruction we offer, and members are rewarded with discounted class tuition, lesson fees and more, that’s true. But there is more to it than that. When we get together to fence, we’re a team and a family. We help each other to train, encourage everyone to keep trying to achieve their goals, go to competitions and cheer for our teammates, and we really get to be great friends beyond the fencing strip. One of the greatest benefits of a Fencing Academy of Boston membership is unlimited use of our facility during club hours for open fencing and personal development. You are encouraged to visit frequently and fence with us! Open Fencing – Open fencing is the term used for a group of 2 or more people who meet to fence outside of a structured class. Fencers should have some fencing experience, be familiar with reffing, and have their own equipment (or be on their way to a full electric kit). Equipment rental available. Mondays and Wednesdays from 7:30-10:00pm are designated for Foil Fencers 15 and older. Tuesdays and Thursdays from 7:30-10:00pm are designated for Saber Fencers 15 and older. 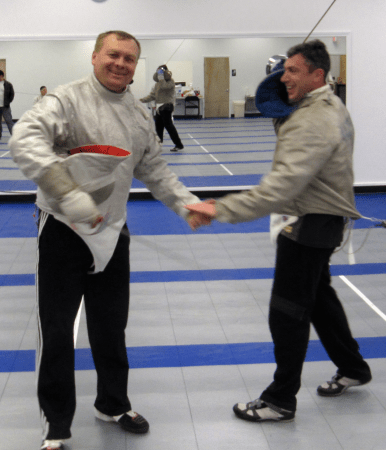 Fencers are not restricted to those nights – contact your fellow fencers and meet up at your convenience during club hours for added practice, provided it does not interfere with our classes. Floor Fees – $20 per visit for non-members to fence or train independently. Long athletic pants made of a stretchy material, such as track pants, leggings, or sweats – no shorts. Clean, dry, rubber-soled shoes or sneakers – no sandals, flip-flops, vented trekking shoes, hard-soled shoes, cleats, boots, or bare or stocking feet allowed. We have private locker rooms to change clothes, hang your coat, and store your personal belongings. Fencing gear is provided for beginners. Membership in USFA is required to fence at Fencing Academy of Boston.